Banpresto, a company which makes official Pokemon Ichiban Kuji (different Pokemon themed prizes that can be won by lottery), is preparing an Ichiban Kuji dedicated to Magikarp. The Magikarp Ichiban Kuji is scheduled to begin at Japanese retailers from January 27, 2018. One try costs 620 yen. 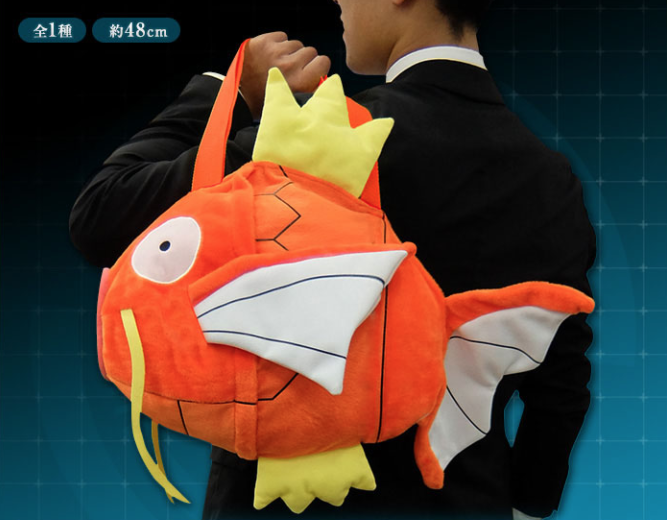 Although there aren’t many pictures released for the Magikarp Ichiban Kuji yet, we do have a look at Prize A, a giant Magikarp bag that is 48cm long. Check it out below.